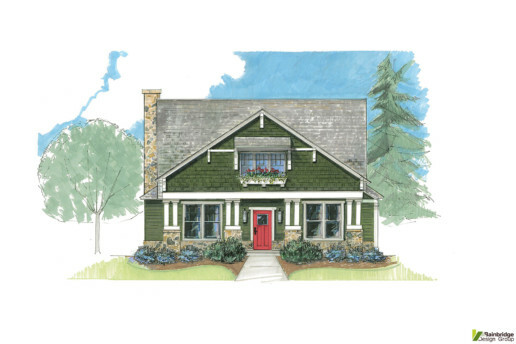 The Craftsman style is a byproduct of the American Arts and Crafts movement, which began in the late 19th century and emphasized the value of the individual tradesman as opposed to the industrial machine. At the outset, the Craftsman home utilized locally sourced materials and the talents of artisan laborers to create functional living spaces with an understated attention to detail. In a nod to the influences of Eastern architecture on the style, roof systems are low pitched and gabled with exposed rafters or triangular knee braces adorning the gable ends. Exterior walls are clad in one or more varying styles of siding: lap, board and batten, or shake. These homes invariably include a large front porch most often with tapered wood columns resting on brick or stone footers. In an authentic Craftsman the artisinal charm evident on the exterior is reflected throughout the living space, creating an environment that is as much warmth and comfort as it is work of art.